Bleeding Kansas is the name given to a small scale civil war that took place in Kansas territory 1855-57 over the issue of slavery. It followed the Kansas-Nebraska Act, let voters got to decide on whether Kansas would have slavery, so pro and anti-slavery forces in other states subsidized armed immigrants, who fought it out. 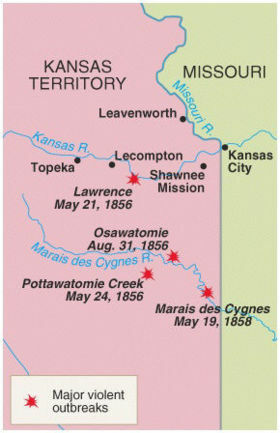 Major violence took place when pro-southern elements from Missouri burned Lawrence in retaliation by the killings of pro-slavery men by John Brown. President James Buchanan intervened on the pro-slavery side, but that broke apart the Democratic Party, as Stephen Douglas was outraged by Buchanan's violation of democracy. Nevins, Allan. Ordeal of the Union. vol 2 (1947), the most detailed history. SenGupta, Gunja. “Bleeding Kansas: A Review Essay.” Kansas History 24 (Winter 2001/2002): 318-341. This page was last modified on 9 April 2019, at 00:41. This page has been accessed 5,557 times.